This tutorial shows how to share novaPDF in a network so that other client computers can connect to it and send documents for conversion to PDF. 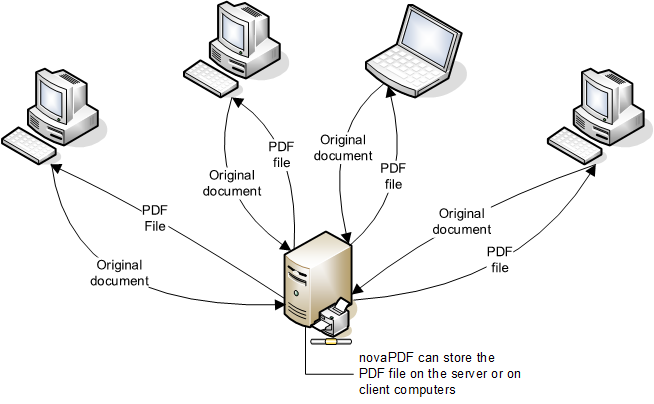 novaPDF can be shared as a network PDF printer, can be installed on Terminal Servers and allows printing through Remote Desktop Connection. If you don't have novaPDF installed, use the Download page to download and install it. 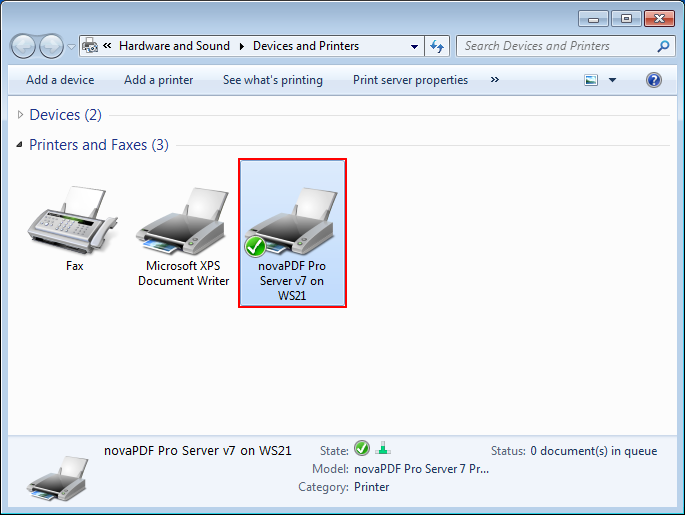 Once installed, novaPDF can be shared as a network PDF printer, installed on Terminal Servers or accessed via Remote Desktop Connection (starting with version 8 these features are available for all novaPDF editions - in v7 and previous only the Server editions had this functionality). 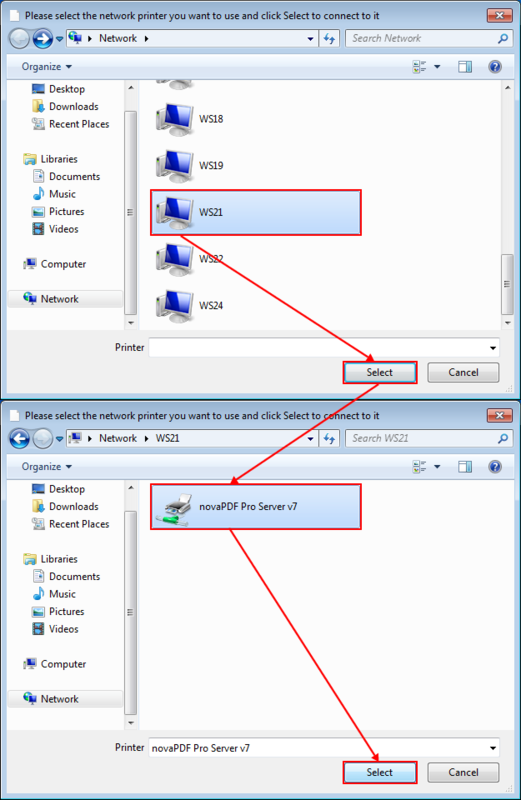 After novaPDF is installed on the PDF printer server, it needs to be shared as a network printer, so that on the client computers it can be added as a remote PDF printer. in case novaPDF needs to be updated that will be done only on the PDF server where it's installed. On the Sharing tab of the novaPDF Properties window, click on Share this printer and enter a Share name for it (this will not change the name of the local printer, will be used only for the network printer share). NOTE: If you are using Vista or Windows 7 make sure that the option Render print jobs on client computers is not checked. Click OK to save these settings. A sharing mark will be displayed in the lower left corner of the novaPDF printer icon. 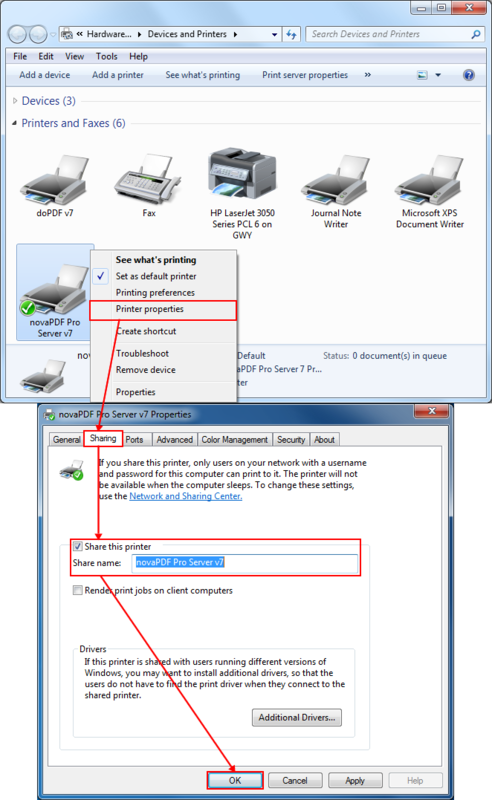 To be able to print to it from other client computers in the network it will need to be added as a network PDF printer on those computers. After novaPDF printer was successfully installed on the server computer and shared as a network PDF printer (see first part of this tutorial), you'll need to add it as a remote printer on the client computers that will use it to create PDF files. On the client computer go to Start->Devices and Printers and click on Add a printer. 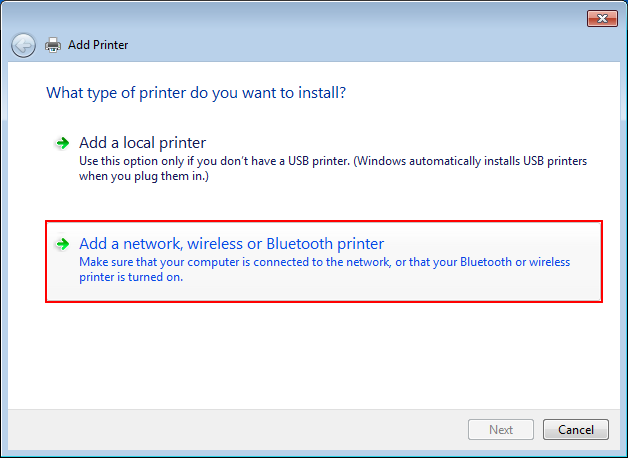 On the Add Printer window select Add a network, wireless or Bluetooth printer. 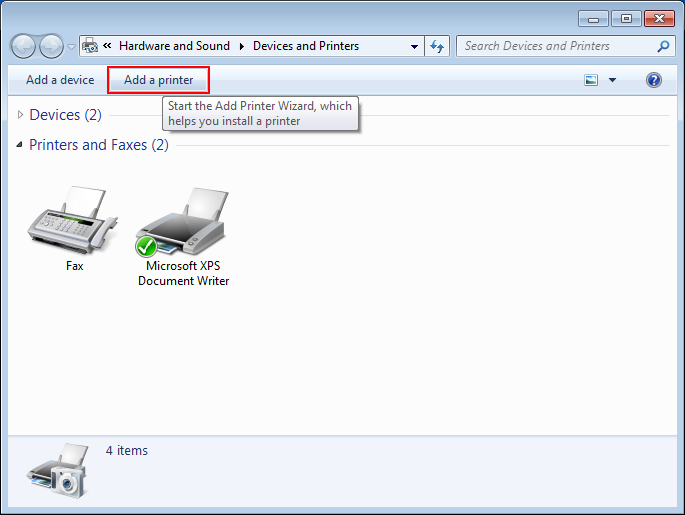 The wizard will automatically search for any printers available on the network. 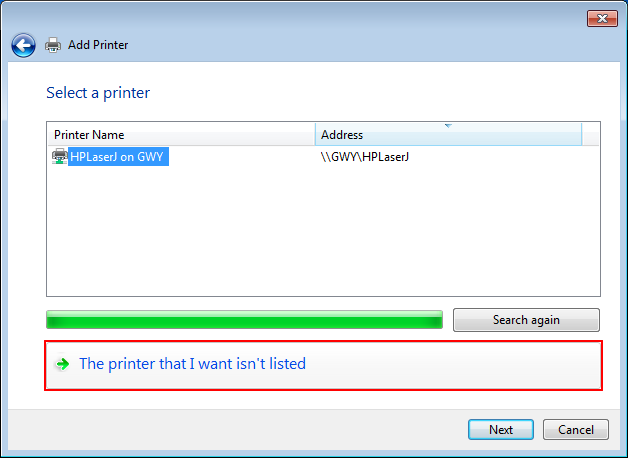 If the printer is not listed after the search is over, select "The printer that I want isn't listed". 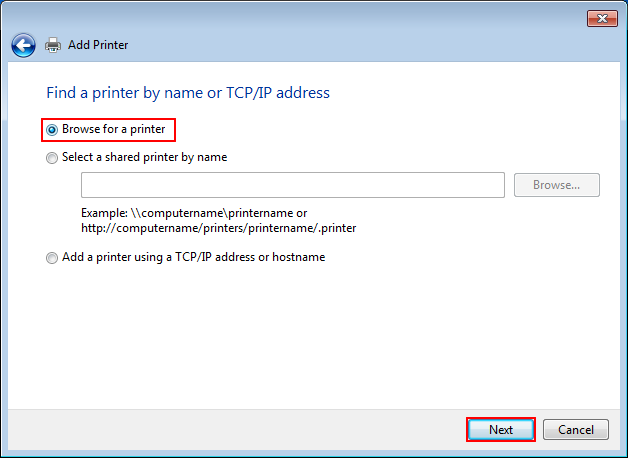 In the "Find a printer by name or TCP/IP address" step, select Browse for a printer and click Next (if you know exactly the host name of the PDF printer server and the Share name you used for novaPDF, you can select Select a shared printer by name and enter the full path to it in the designated field). Browse for the network PDF printer shared earlier on the Server computer and click on Select. After you click on Select, the software drivers will be installed automatically (a warning window will pop-up, click "Install driver" to continue). After the process is complete you can create a test PDF file by clicking the "Print a test page" button. A novaPDF printer will be added to the list of available Printers and Faxes on the client computer and will be ready for use. License management for novaPDF can only be done on the server computer where it was installed and shared from. If a print job is started from a client computer in the network to the shared novaPDF printer, the client computer name will be automatically registered and a license assigned to it. On the server computer where novaPDF is installed and shared from, go to Start->Devices and Printers, right-click on novaPDF and select Printing Preferences. In the About tab click on the Licenses button to open the license management window. Use the Add, Rename, Remove or Unlicense buttons to manage the licenses. This window also displays a status of currently available/assigned licenses, as well as a list of the licensed/unlicensed computers (using their NetBIOS or DNS names, depending on your choice). How do I reinstall novaPDF Server on client computers and on the server? If you want to reinstall novaPDF Server from the client computers and from the server itself too, there are a couple of steps you should follow to make sure you succeed with the reinstallations, including making sure you first remove all the previous installations / versions completely. This tutorial shows how to convert a Microsoft Visio file to a PDF. novaPDF is a PDF converter that allows creating PDF files from any Windows application that supports printing. If you don't have novaPDF installed, use the Download page to download and install it. SAP R/3 is a previous version of the enterprise resource planning software created by SAP AG, that is now called SAP ERP. Being an older version, when trying to print directly to novaPDF, it will not work.